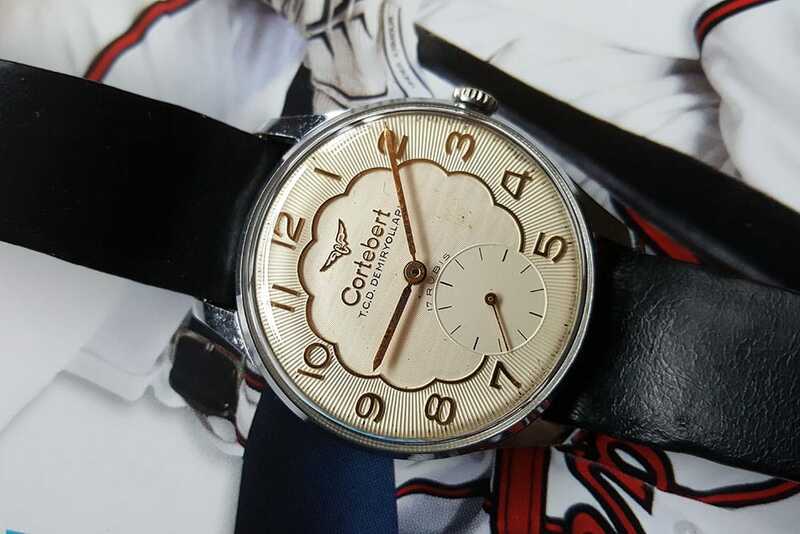 Cortebert is probably best known for their railroad watches. They supplied both the Turkish as the Italian railways, though they used the Perseo brand name for the Italian railroads. T.C.D. Demiryolları is the Turkish State Railways (Türkiye Cumhuriyeti Devlet Demiryolları), so this watch was for the Turkish railroad system. It’s powered by the Cortebert 739, which is a rebranded Unitas 6325 movement, a so-called “Wehrmachtswerk”. The movement with the stem release button, mobile stud holder, and KIF shock protection date this watch to the late 1960s. This Cortebert did run but the amplitude was very low and the watch gained a lot of time. The hands also seemed to be misaligned and you couldn’t feel any resistance while setting the hands. 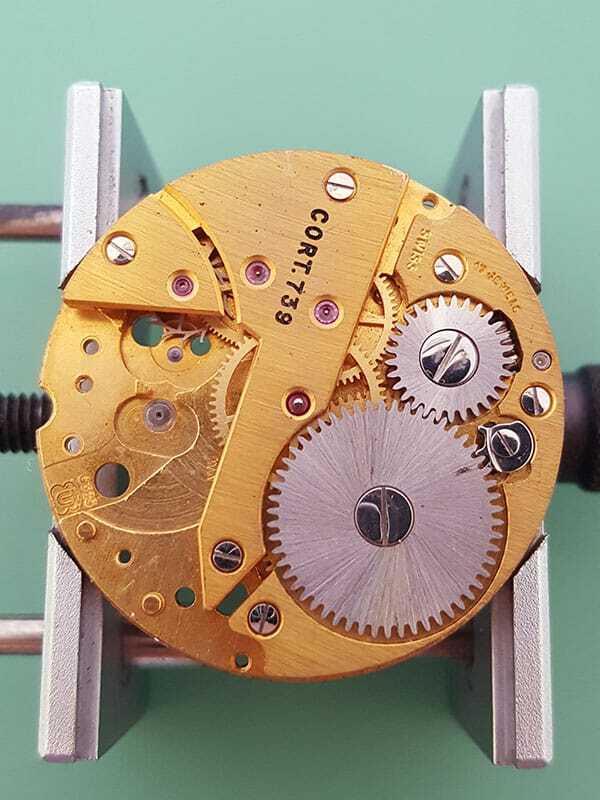 As always, remove all power from the mainspring to prevent damaging the escapement or wheel train. Remove the balance and the pallet fork and store them somewhere safe. Some like to use a balance tack, others store the balance upside down in a tray with a cover. Without the balance and pallet fork, this is a good time to test the wheel train. Temporarily, fit the winding stem and crown and give it a few turns. The wheel train did spin freely but a bit sluggish due to hardened lubrication. This is one of the reasons for the low amplitude. Normally, this would be the time to remove the cannon pinion because it’s safer to remove with the wheel-train bridge installed. If you don’t remove it, you won’t be able to lift the center wheel later. In this case, the cannon pinion was very loose and it came off with the hour wheel. It’s possible to tighten the cannon pinion but I just ordered a new one. Be careful to order the correct one because they’re available in four heights! Lift the wheel-train bridge and remove the escape wheel, the fourth wheel, the third wheel, and the center wheel. Always check the pinions of the different wheels. Lift the main barrel. I always order a new mainspring when the amplitude is low, so I removed the old mainspring from the barrel and placed the barrel, the lid, and the arbor in the cleaning basket. Pre-clean the pivot holes and bearing jewels with a peg wood and Rodico. 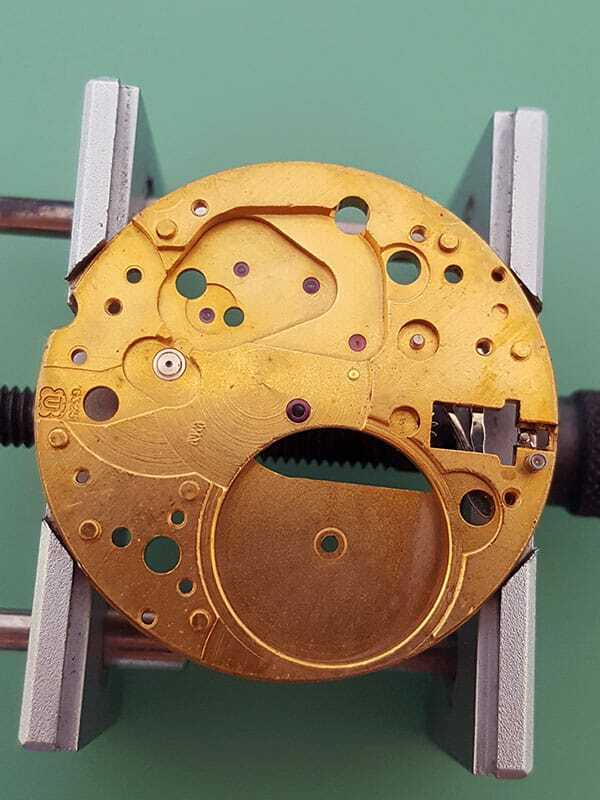 The watch cleaning machine always has a very noticeable effect on brass and copper colored movement. It seems that these metals develop a slight patina over time and the cleaning fluids very effectively remove that. Place the main barrel in position (of course, you need to fit the new mainspring first). Install the escape wheel, the fourth wheel, the third wheel, and the center wheel in position. Don’t forget to slightly lubricate the post of the center wheel (HP 1300). Install the barrel bridge, the crown wheel, and the ratchet wheel. Use a little bit of HP 1300 on the crown wheel shim. The Unitas 6325 has a set lever with a button as a release instead of a screw, so place that into position first. 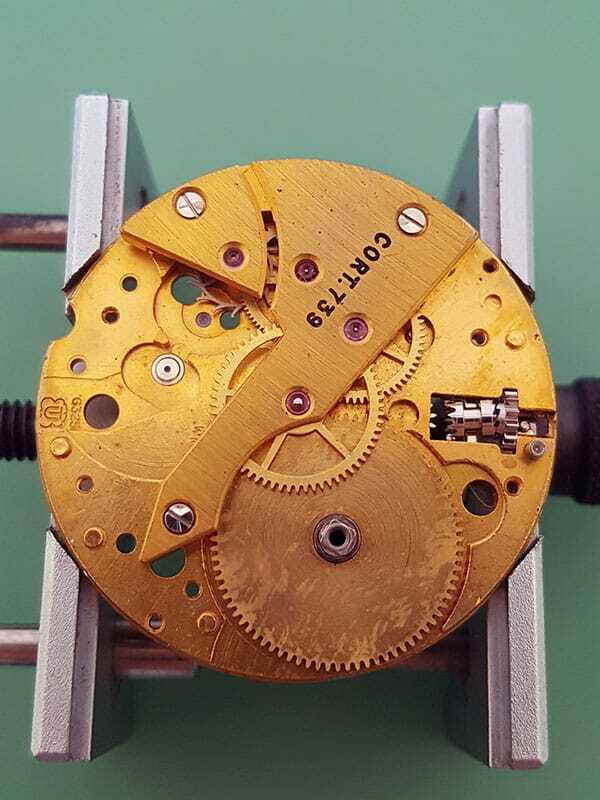 Lubricate the (new) cannon pinion, the return bar and its spring, the winding stem, the setting wheel and intermediate wheel, and the clutch and winding pinion with 9501. Lubricate the bearing jewels on the dial side. Use 9010 for the escape wheel, third wheel, and fourth wheel. NEVER lubricate the bearing jewel for the pallet fork. Flip the movement to the top plate and reinstall the pallet fork (lubricate the exit stone with 9415). Place the balance into position and enjoy the watch coming alive. Clean the KIF capstones on both sides with One Dip or similar (I’ve used lighter fluid with good results as well) and lubricate them with a tiny bit of 9010. Remove old hardened lubrication with a peg wood. I fitted a new acrylic crystal because the old one was too badly damaged. I used a “Lentille” style crystal to keep the sleek design intact. What do you think of this Cortebert with a link to the Turkish Railroads? Would you add one to your collection? Let me know in the comments below. Hi, it’s not my watch to sell. I only repaired and serviced it. You can buy similar watches on eBay, search for Cortebert 739.